The Pacific Coast Scenic Byway has some of the most impressive ocean and beach views in the United States. The Pacific Coast Scenic Byway is also known as Olympic Coast Highway, WA-101. The Olympic Highway loops around Olympic National Park making it a great route for those who wish to see the entire park. The Pacific Coast Scenic Byway follows the original route of US Highway 101 and is also known as the Olympic Highway. Not only does this road span from the Oregon-Washington border, but it also loops around Olympic National Park in the north. The Pacific Coast Byway passes incredible sights including the bogs of the “Cranberry Coast” near Long Beach, the ancient trees of Quinault Rainforest, and the sea-stacks of Neah Bay. Why should I drive the Pacific Coast Highway? There are many natural treasures to be found along Pacific Coast Highway. Along the coast, travelers will enjoy breathtaking views of the Pacific Ocean, sea-stacks, beautiful camping beaches such as Kalaloch and Ruby Beach, and perhaps even a passing whale pod. Inland, the road passes mossy rainforests, such as the Hoh Rainforest, alpine slopes such as in Deer Park and Hurricane Ridge, and loops around the Olympic Mountains to the dense Evergreen woods between the Hood Canal and Olympic National Forest. There are also several charming towns and historic cities to visit along the loop, including the town of Forks and the cities of Port Angeles and Port Townsend. Where does the Pacific Coast Scenic Byway begin and end? The Pacific Coast Scenic Byway stretches along the Pacific Coast in Washington State. Though US-101 used to stretch from southern California all the way to Port Angeles, Washington, stretches of the roadway have been closed due to the popularity of I-5 and can no longer be traveled straight through. Travelers can drive the length of Washington State by catching the Pacific Coast Byway in the city of Illwako, WA. The Pacific Coast Highway then follows the coast and stretches past the town of Forks to the top of the Olympic Peninsula. The Byway continues east, past the city of Port Angeles, and then heads south into the Hood Canal. The Pacific Coast circles the Olympic Mountains and the entirety of Olympic National Park and Olympic National Forest. How long does the Pacific Coast Scenic Byway take to drive? 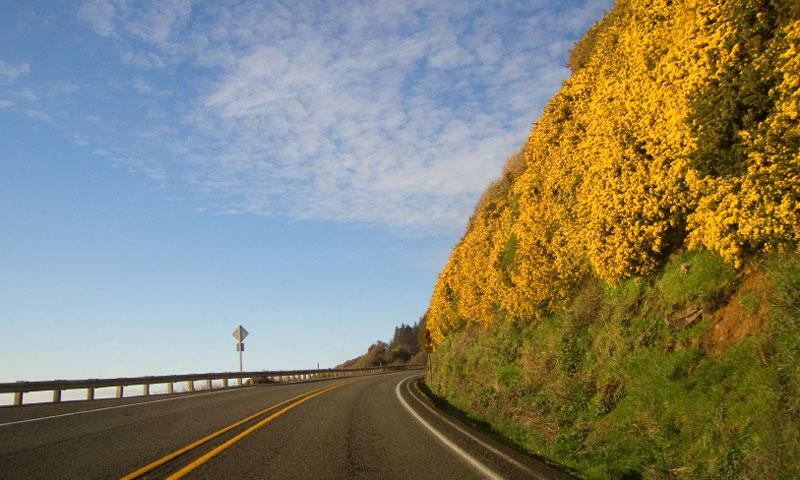 The Washington portion of the Pacific Coast Scenic Byway is approximately 380 miles long. While the drive could be completed in roughly 9 hours, there are so many delightful sights along the road travelers could plan to take a week exploring sites along the Pacific Coast Scenic Byway and not see everything.